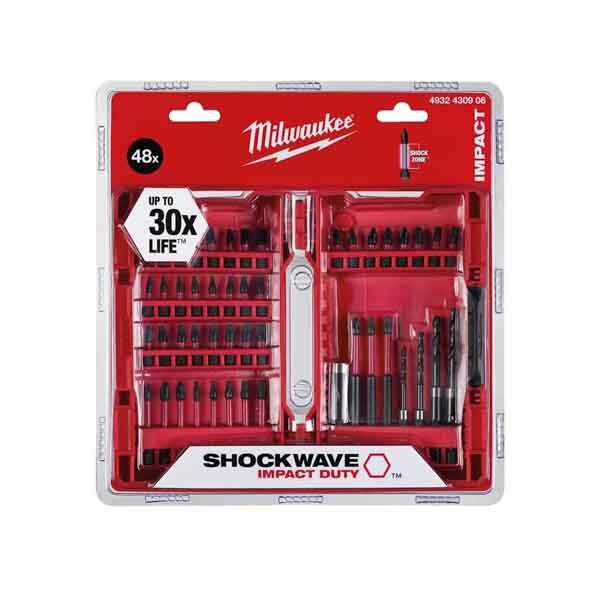 The following sets are available in this category: Milwaukee 15 Piece Shockwave Puck Set, 33 pc Shockwave Impact Bits and Nut Drivers Set, 48pc Shockwave Impact Driver Bit Set and 56 pc Shockwave Drill/Screwdriver Bit Set and 12 Piece Shockwave Impact Duty Driver Guide Bit Set. Milwaukee Shockwave sets from SGS Engineering are a superb investment as they provide you with an extensive range of bits that allow you to take on any task. They can include Milwaukee Shockwave drill bits, puck sets, impact bits, nut drivers and screwdriver bit sets. The Milwaukee Shockwave sets can provide you with everything you need to take on many DIY projects around the home, but they are also handy for professional tradesmen as they can serve so many different purposes. Milwaukee Shockwave drill bit sets come with various lengths of drill bit, from 70 mm through to 96 mm, whilst the impressive 48-piece Milwaukee Shockwave Impact Driver Bit Set provides the parts you need for both heavy duty and smaller applications. There is also a 56-piece Milwaukee Shockwave Drill Bit Set for use with impact drivers for those that require a greater range of parts. Milwaukee Shockwave sets offer 30x longer life than the competition thanks to the optimised Shock Zone geometry, which reduces stress at the tip and results in fewer breakages. The custom engineered metal formula makes the Milwaukee Shockwave titanium drill bits resistant to shock from impacting and the compression forged tip provides the best fit with the screw head. This reduces cam out and stripping for optimised performance. Purchase Milwaukee Shockwave Impact Duty sets from SGS Engineering today and you will receive a three-year warranty on your purchase. Buy now and see what working with the best is like.